Sheffield’s pretty high flying when it comes to media. Everybody knows that and we’ve got loads of creative companies to boot! So when you say you want to get into media, we don’t blame you. There really isn’t a better city to kick start your media career in. Our media, journalism and photography study programmes will give you the perfect base to launch you into a career in journalism, social media, photography, film production, marketing or as a high-flying TV executive. Sound exciting? It really is. We’ve recently invested millions of pounds in our Hillsborough Campus to provide you with the best media opportunities in the region. We’ve got photography studios, recording studios, a TV studio, edit suites and production facilities for TV, radio and film. We work with a whole host of local employers in the industry to make sure we open as many doors for you during your time here as possible. Recent opportunities have included filming and reporting live Sheffield Sharks basketball matches, as well as projects through our partnership with Televideo. We don’t just expect you to turn up and complete your study programme. We go further to support you to get as much as you can from your time with us, and help you to ensure your CV will make employers look twice. Our tutors are all experts in their area and many have worked in the industries they teach in. For example, our journalism tutors have worked – and still do work - for newspapers and magazines across the country. They know all the ins and outs of the industry, and there’s nobody better to help you start your career than people who have previously done the job you want. All of our tutors are passionate about inspiring and teaching the next generation of creatives! Most of our tutors have worked in the industry in some form or another, and many of them still do freelance work alongside their teaching commitments - so you can be sure that they're teaching you the most up to date content and ensuring that you develop the knowledge and skills you'll need to launch a successful career in journalism, TV, film or photography. Our media facilities are truly second-to-none! Based at our creative hub, Hillsborough Campus, we've invested millions into our state-of-the-art media provision. We’ve got photography studios, recording studios, a TV studio, editing suites and production facilities for TV, radio and film. All of these are set up with the equipment you'd expect to find out in the real world, so you'll be prepared to make the jump into employment when the time comes. You'll also have access to cameras, lighting and sound equipment and professional-spec software to help you with your projects and assignments. If that all sounds too good to be true, come down to one of our open days and check it out for yourself! Our aim for every student is to get you as work-ready as possible during your time with us so that you're ready to go further in your career. One of the key ways we achieve this is by giving students opportunities for work experience - whether that's through working on employer-set briefs, getting hands-on experience of working on professional projects or by visiting organisations in the industry to contextualise your learning. We also encourage our students to undertake longer-term placements with professional organisations where possible - luckily many of our tutors have professional contacts in the industry and they can support you to find the right placement. 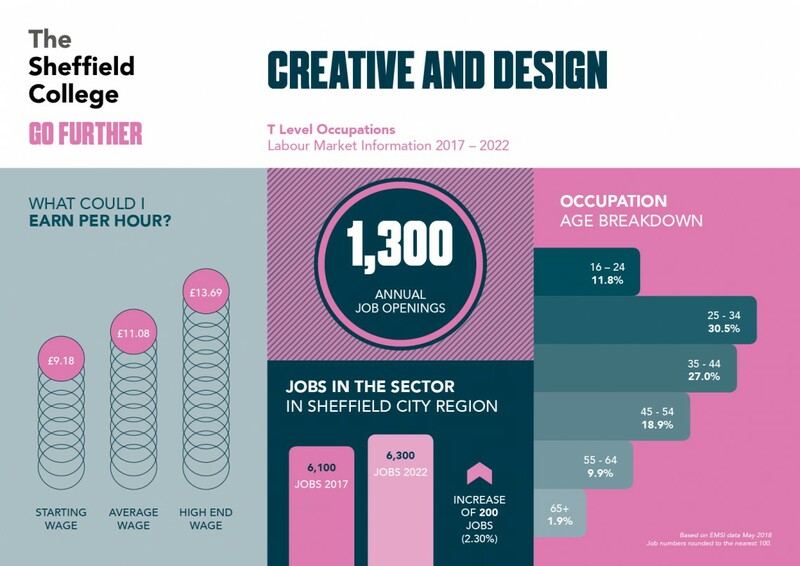 Being the creative city that Sheffield is, there are a wide variety of jobs available in this sector - in fact, it's estimated that there will be an 8.5% growth in job vacancies for this market by 2022, taking the number of jobs up to 4,700! If the wide variety of job roles is a bit overwhelming, you can use our online tool, Career Coach, to find more information about specific job roles, plus insights into average earnings, local job vacancies and CV-writing tips. "The software and facilities available to me as a student really helped with my course and building my experience. "